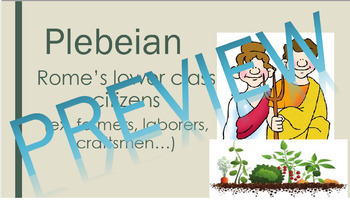 This editable PowerPoint features student friendly definitions for key vocabulary terms that fit perfectly into a unit about Ancient Rome as well as a vocabulary TicTacToe with 9 formative activities to build a stronger understanding of the words. Also includes a link to a quizlet specifically built around these vocabulary words. 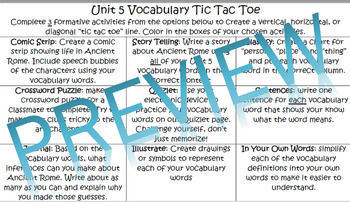 The TicTacToe makes differentiation easy with mixed activities that can meet the needs of students who are above expectations, meeting expectations, or approaching expectations. If you have leveled groups in your class you can choose the 3 activities for them or let students take ownership by choosing the activities themselves. with option to edit and add your own key terms.